As you already know, Mo Phillips is a super rad mega star in our house, so when we heard that he and his band would be kicking off the St Johns Bizarre we were pretty dang psyched. It didn't matter that we also had to ready ourselves to be in the parade (with F's preschool), first we'd have to hit the St Johns plaza and get funky with Mo. Oh, and eat a hand-dipped corndog, because that is what parade day is all about, ya'll. Here's a video of our sweet friend Lux twirlin' to the song Twirlin' which appears on Mo's brand spakin' new album Monster Suit. Because Mo is a totally awesome dude, he gave me a CD to give to one of YOU. All you have to do is leave a comment here answering one of the following questions: What's your favorite Mo song? What's your favorite carnival food? Got a Worst Party Ever Thrown story to rival Mo's (that the title of a song on the new album)? If you were a float in a parade, what would you be? Okay so answer one of those four questions here, and next Monday I'll come back an announce the winner (using random.org's number generator). Also, if you happen to be one of the many clients and/or friends I'll run into at Pickathon this year, and you think Mo would be a perfect fit for a morning kiddo performance, email Pickathon and tell them so: info@pickathon.com. Seriously, Dudes, it would be so fun to have him there! PS- if you're wondering where my excited Mo-loving girl is in that video, she's clinging to my leg. She rushed to Mo and gave him a handful of flowers when we arrived, and shouted at him once during the performance, but she is also exceptionally shy and does not twirl in public! Thankfully, she wasn't too shy to belt out the lyrics to the songs she knew, and I think she let go of my hand and shook her hips a few times during the last song. UPDATE: The winner is comment #7, Stacy Smelser! Congratulations, Stacy!!! When Franny was a baby I vowed not to play kid music for her, hoping to avoid the endless replaying of Raffi (nothing against Raffi, seriously, but you know what I mean, right?). This backfired when Franny became obsessed with the music of Lady Gaga, Kanye West, Journey and Rihanna (umbrella, ella, ella...). It turns out, any music on constant repeat gets old fast. The girl is now over four, and though her favorite musicians include the Decemberists, Donovan, Carole King and the Beatles, she also really digs Kimya Dawson, "The Maybe Giants" (They Might Be Giants), and Portland kindy rock star Mo Phillips. We love Mo's music, and though we are extremely excited about his upcoming album, we have not grown tired of the last one, which we play very regularly. I find myself singing the songs when Franny isn't even around, and I never cringe when she asks me to play his music. So when Mr. Phillips rang me up and asked that I provide him with some fun new photos to use for promotion of his new album, I agreed to it, of course, set up the details, hung up the phone, and ran into Franny's room: "Guess who just called Mommy?!!!" It is true that I had already met and photographed Mo, but that day he was Mo the father and husband (and soccer player), so when I blogged those photos I didn't even drop his name. But this time around I was photographing the celebrity Mo Phillips, and I earned major cool points with my preschooler; she sat on my lap while I edited the photos, chose her favorites, and giggled a lot. "Mo Phillips is SO goofy." She's got that right. If you live in Portland and have children, you should definitely check out a live Mo Phillips show. If you don't live in Portland, you should order his CD. Mo and I have a little something else up our sleeves, but you'll have to wait until April to find out about it. Happy weekend! Some kids are not so crazy about being told what to do (um, most kids? ), some kids prefer being on my side of the camera, some kids are really shy, and some kids are so camera phobic they get excused from school photo day. Henry is in the latter group, so when his mom contacted me about having family photographs taken, she explained that I would have a challenge to overcome. We spoke at length about her son's reluctance, and ways we would work around it without making him feel like he was being tricked into something. We hatched a plan, we checked in with each other prior to the session, and then I just showed up one morning and photographed the family doing their thing. Because that's what I love to do - let kids call the shots, literally, and capture them being themselves. It is more common that a child have some resistance to the photo session than not. Honestly, when a child just sits down and starts posing I don't know what to do with myself (okay, not true, I snap a few shots and then I try to get them to laugh and be silly). 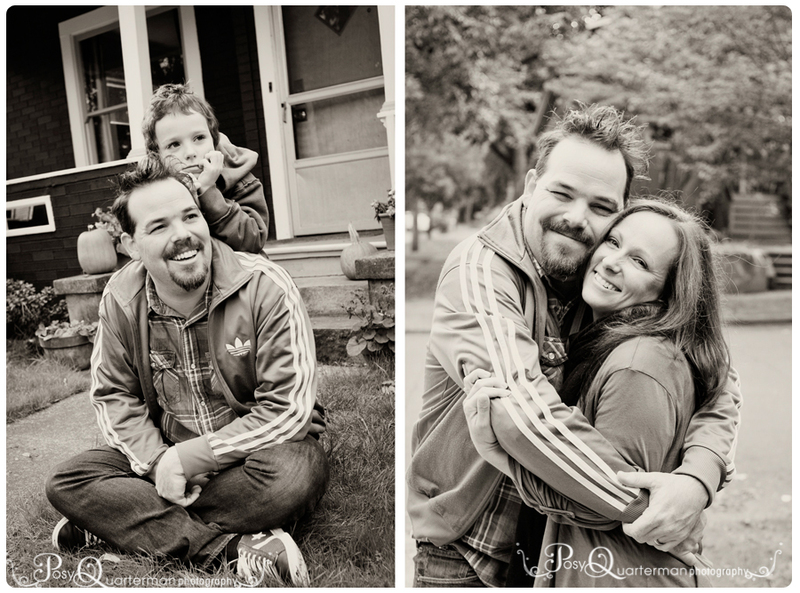 If you have resisted having your family photographed because you have a reluctant child, know this, I do too. My daughter Frances is four, and for the last two years she has become increasingly camera-shy. Initially I thought it was because I photographed her every move, but as she has grown into herself more, I have come to realize that it is just part of her personality; I see it in other aspects of life as well, it isn't just the camera, for her it is more the attention on her and expectation. So as you can imagine, when I scheduled not one but two photo sessions for our family this year, I was pretty sure at least one would be a bust. My goal was to get photographs of us together, but I really never expected her to face the camera and be her normal goofy self. You should have seen the way she worked it for the photographers - she was over the top Franny. I tell you this because sometimes kids really turn it on for other people, sometimes they do just the opposite of what you would expect (okay, most of the time), and more frequently than sometimes, kids eventually drop their guards and relax into themselves, making for photos that may not be deemed "proper" family portraits, but something bigger and so much better: records of your family as they were for this fleeting moment in time.